Russet potatoes are grown in many states, however, only potatoes grown in Idaho can be called Idaho® potatoes. Idaho’s ideal growing conditions – the rich, volcanic soil, climate and irrigation – are what differentiate Idaho® potatoes from potatoes grown in other states. 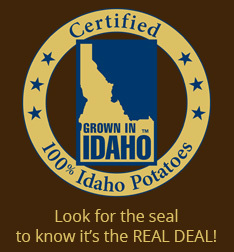 "Idaho® potato" and the "Grown in Idaho®" seal are federally registered Certification Marks that belong to the Idaho Potato Commission (IPC). These Marks ensure that consumers are purchasing potatoes that have been grown in the state of Idaho. The IPC works hard to protect these trademarks and ultimately the integrity of the "Idaho® potato" brand, which is recognized around the world as a premium potato. In fact, recently a trial was held in the U. S. District Court for the Southern District of New York where a jury concluded, and a Judge affirmed, that “Idaho” was not generic for any russet potato. Idaho's growing season of warm days and cool nights, ample mountain-fed irrigation and rich volcanic soil, give Idaho Potatoes their unique texture, taste and dependable performance. Why bother with potatoes that are only available in season? Survey after survey points out the high brand awareness of Idaho Potatoes. 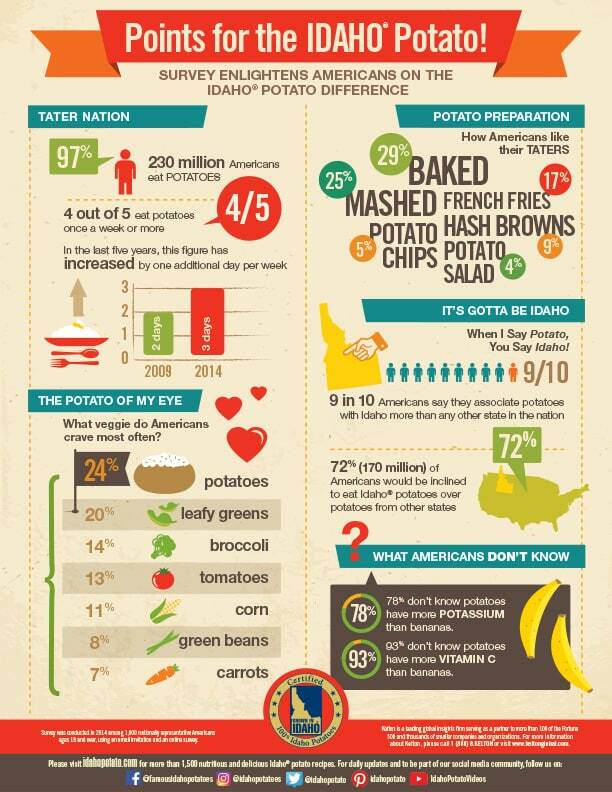 They far outscore other states' potatoes in customer preference and awareness. Cash in on the famous Idaho Potato brand equity EVERY time you sell a potato. NFP Research's 1999 Brand Communication survey found that only a small portion of operators communicate the state source of their potatoes (21%), but of that group, 58% communicate "Idaho" because, as one operator responded, "...patrons will know we use the best quality"